For those who have grown to appreciate the Lamar Hunt U.S. Open Cup for its history, gritty displays and penchant for upsets, the Washington chapter can deliver on all those counts and more. When Sounders FC pulled into the StubHub Center’s track venue for the quarterfinal date with the Galaxy last month, it was almost like old, old times. Like when a Seattle side first ventured into southern California for a quarterfinal that, incidentally, was 50 years ago. Rather than recite every last detail of the USOC games of the past six decades and repeat everything known about the past 10 years of Sounders success, instead here’s an invitation to take a spin down memory lane for some choice excerpts, most of which predate the common fan’s first hands-on encounter with America’s oldest soccer tournament. Those who have scratched beyond the surface of the Open Cup know that its roots are in the Northeast, with largely ethnic clubs doing battle. Then known as the National Challenge Cup, it took a half-century for the tournament to truly become national, first reaching California in the Fifties and finally landing in the Pacific Northwest in 1964. Up until late autumn of ’64, teams from Washington rarely interacted with the world outside state borders. There was the annual regional bragging rights game with Oregon’s top teams and mostly friendlies with British Columbia’s best. Until, that is, Thanksgiving Sunday, when Fort Lewis (think JBLM 1.0) sent their state league side to Denver to face the more established Kickers. Fort Lewis fell, 4-3, but that’s not the end of the story. Immediately after that match, the Fort Lewis coach, an Army colonel, protested, claiming the Kickers had used an ineligible player. The Rangers were awarded a forfeit and began preparations for a second round match. But Denver counter-protested, arguing the Army’s roster included 17 non-registered foreign nationals. That, too was true. Both teams were disqualified. Fast-forward to 1983, when Seattle Croatia stunned San Francisco’s Greek-Americans in the quarters (obviously the ethnic theme was still prominent). The Greeks objected to the fact Croatia used an ineligible player, former Sounders legend Pepe Fernandez. U.S. Soccer agreed; Croatia was eliminated. A federal judge in Seattle reinstated Croatia. U.S. Soccer appealed and a replay, literally on the eve of the national semifinal in Houston, was ordered. Seattle won again, 1-0, then bowed out to the fresher New York Pancyprian Freedoms, 4-2, who would go on to claim the Cup. That summer Croatia had boldly gone where no Washington club had gone before: the final four. Four years later, rebranded as the Mitre Eagles, Seattle returned to the semifinals in St. Louis. Their team, featuring a few ex-Sounders and local college stars, shocked the local home side, Busch SC, on John Klein’s winner with 30 seconds remaining in extra time, 5-4. DC’s Club España, which had a much easier semifinal, prevailed on penalties, 4-3, after 120 scoreless minutes. Technically, no Seattle team has lost a final; in ’87 and again in 2012 draws were decided by shootouts. In 132 Open Cup games to date (both proper and play-in qualifiers) nil-nil score lines are scarce. Just four, in fact. More than half involve at least one of the sides scoring three times. As it turns out, the highest scoring match of the modern (pro) era was also the Sounders’ first foray into The Cup (NASL clubs, including the original Sounders, had shunned the tournament). It not only rained for their 1995 opener against the (D3) Everett Big Foot, it rained goals, 11 of them. Up 9-0, the Sounders pulled off two players without substituting. Everett scored two consolation goals. The beauty of a knockout tournament is the shocker, when the semi-pros or clubs from a lesser league take down the giants. Kitsap Pumas (PDL) is alive today after surprising the USL Sacramento Republic, 1-3, in the third round. Certainly the USL Sounders slay their share of monsters in the Cup runs of ’07 and ’08, with a combined three wins and draw (advancing on penalties) versus MLS members. However, the mother of all upsets belongs to their erstwhile second team, the Sounders Selects, in 2001. A U-23 PDL squad more accustomed to facing the likes of the Okanagan Predators and Yakima Reds, the Selects were drawn away to the Dallas Burn of MLS in the second round. Approximately 50 places separated these contestants from the fourth and first levels in the US pyramid. It was a mismatch made for the small town of Duncanville, Texas, and prep football venue Old Panther Field. Understandably, Dallas started six reserves, including a 17-year-old prospect named Eddie Johnson playing up front with Jason Kreis. Among the Selects were three high school players and a handful of future A-League Sounders. Seattle never trailed, striking for the opener just before halftime. Behind, the Burn inserted three regulars early in the second half and equalized for a second time in the 78th minute. Seven minutes into the golden goal extra time, Kurt Ness, a freshman from Oregon State, sent a jolt through the bracket by capitalizing on a Dallas turnover to score the winner. While the A-League Sounders were being bounced by Kansas City, 4-0, the farm team was booking a flight to Orange County and a date with Sigi Schmid’s Galaxy. Seattle struck first, but soon the jig was up. In the final half-hour former Husky and Sounder Craig Waibel tied it, Alexi Lalas got the go-ahead header and Brian Ching essentially ended the Selects’ sweet ride, 3-1. L.A., incidentally, would go on to lift the Cup. Seattle teams have largely avoided missteps such as when Dallas was burned. Bay Area Seals eliminated the defending A-League champ Sounders in ’97. The first outright USOC loss for Sounders FC was to Tampa Bay in ’13. But those were road games against clubs from one level below. Schmid’s regard for history and the USOC is reflected in Seattle’s consistency over these first eight seasons, not to mention four shiny trophies residing at The Ninety. Of course, sometimes things can unexpectedly unravel. For Sounders FC that occurred on June 16, 2015, when cards began flashing and Clint Dempsey began ripping. It remains to be seen whether the Rave will recover from that debacle and Deuce’s lengthy suspension to win another Open Cup. As for abuse of an official during a Cup tie, it pales by comparison to 1972. Win and advance is the mantra in any tournament setting. As is often the case, not all contests can be decided in 90 minutes. There have been 16 Open Cup-related matches involving Washington teams that have been decided in extra time or penalties. But the longest day was definitely February 13, 1972. Beer sponsorship was big in the state leagues back then. Olympia and Rainier each backed teams and Heidelberg did them one better, sponsoring both the brewery’s hometown Tacoma Heidelbergs, winner of the second division, as well as the first division Heidelberg Brewing of Seattle. On Valentine’s Day Eve, the two Heidelbergs butted bottles at Highline Stadium in a second round game. Regulation finished at 2-2, prompting 30 extra minutes. That ended 4-4. Following yet another 30 minutes – 150 altogether – the Heidelbergs remained deadlocked at 6-6. Seattle’s team may have been favored for its pedigree, but it was playing most of the way with 10 men after one of their top player’s sending off for punching – yes, punching – the referee. The long day’s journey into night would end with Tacoma prevailing on penalties, 5-4. Now back to 1966 and that first Cup stop in the Southland. For nearly a decade the flag-bearer for Seattle had been an equal parts entertaining and ambitious team of ball magicians known as the Hungarians. 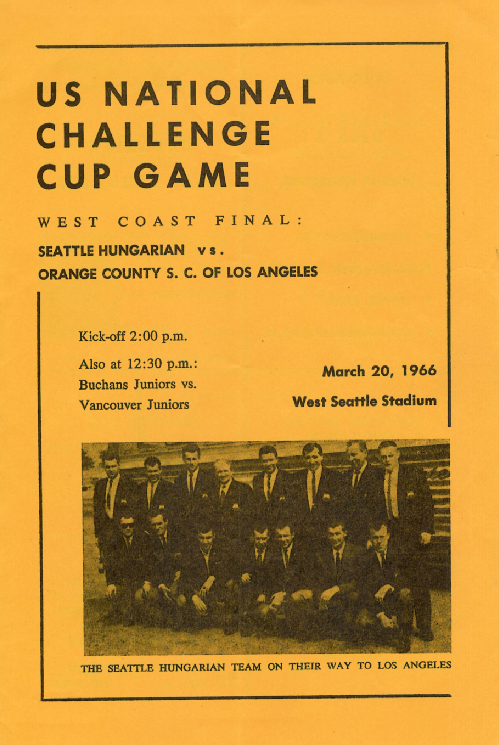 Formed in 1959, the Seattle Hungarians were superior to any foe the state league could offer. Budapest-born Balint Ducz funded the club–which featured several experienced pros, some refugees from the 1956 Hungarian Revolution–with proceeds from a hugely successful Burien bakery. Ducz took the team from the state league to the semipro Pacific Coast League based in B.C., and he could also afford the necessary annual Challenge Cup travel to California. Fifty years ago, the Hungarians seemed poised for a breakthrough. In the West finals they returned from Santa Ana, Calif. with a 1-1 first leg draw against Orange County SC. A clean sheet at home the following week at West Seattle Stadium and they would go through to the 1966 Challenge Cup semifinal. Geoff Wall’s long-range blast put Seattle up 1-nil in the mud, but Orange County squared everything when the Hungarians keeper’s clearance ricocheted off Wall for an own goal. It was a deflating moment, and 15 minutes later the visitors let all the air out of the Hungarians with a second away goal, winning 3-2 on aggregate. As it turned out, although they would extend their run of state league titles to seven, that was the height of the Hungarians’ run. An aging side would succumb in November of 1969. Leif Erikson Vikings, the Scandinavian-leaning entry in the state league, had been applying pressure to the Hungarians for the past year. The Vikings won the state first-half title. In the regional quarterfinal at old Interbay Field, they began pushing the Magyars out of the picture. Tied 2-2 at the end of regulation, they went to extra time and Geoff McKeown of the Vikings proved exceptional. In that decisive 30 minutes McKeown scored three of his four goals, and the Vikings ran away 6-2 victors. It was a changing of the guard in Washington. The Vikings were just getting started. They went on to win the first of back-to-back state championships and, matching the Hungarians’ ’66 feat, reached the Challenge Cup quarterfinals in the spring of 1970. Meanwhile, in ensuing months the Hungarians were eliminated from a state knockout tourney by the Vikings and yielded their state title as well. Not long after showing up for a league match without their kit the Hungarians disbanded, becoming one of the first and certainly most colorful pieces of local Open Cup history. A version of this article first appeared on July 19, 2016 at The Frank MacDonald Blog. A longtime public relations director and contributor to soccer publications, Frank specializes in research of Washington state soccer history. The fruits of his labor can be found at Washington State Legends of Soccer and his blog: FrankMacDonald.net. Follow him on Twitter @frankmSounders. My dad is the fellow bottom right on the hand bill and those guys…Tommy Bacsi, Zoli Bacsi Larry Bacsi, Kucsi Basci (not to mention Ducz Bacsi and all those delicious bakery treats) and their families were my community and whole life …Hungarians who all came together via their love of soccer. I t was a wonderful way to grow up and I am proud of the part they played in bringing such a. wonderful sport and healthful pursuit to the people pf Washington State.